There are so many customs and traditions that go along with Tết–from making sure your house/home is clean, offering ancestral prayers and thanks, eating delicious food, playing games like bầu cua cá cọp, going to festivals and my personal favorite—getting lì xì (red envelopes of money to bring luck and good fortune). Tết is a multiple day celebration—which means food galore! Bánh chưng (sticky rice cakes filled with meats, mung beans, etc. ), Xôi (savory or sweet glutinous rice), Măng khô (braised bamboo shoots), and all sorts of Mứt (preserved/candied vegetables and fruits). And although the trays of Mứt always had a wide variety of fruits, veggies, & nuts to choose from (coconut, lotus seeds, persimmons, mandarins, etc. 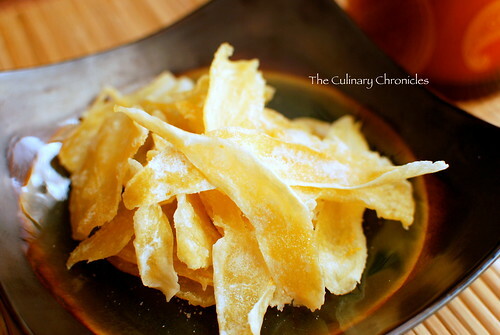 ), my favorite was Mứt Gừng —candied or crystallized ginger which my grandmother made all of the time. 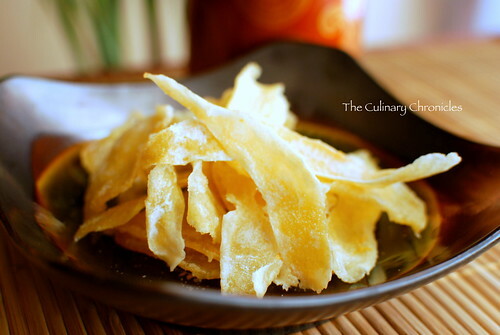 The thin slices of candied ginger are not only yummy but they can be used for health ailments too. Nausea or motion sickness can often be curtailed by chewing/sucking on Mứt Gừng and next time you have a cough, forgo the drops and grab a bag of Mứt Gừng instead. You can also filter the boiling water used to cook the ginger into a calming ginger tea. All natural! And as for baking, I’ve also used this Candied Ginger in my Scones and to top Spiced Cupcakes. So many options! So allow me to wish you all an extremely happy, prosperous, and healthy New Year! Fill a large bowl with cold water and add 1/4 cup of lemon juice. Peel the ginger, removing any blemishes from the root and then place in the bowl of water until all pieces have been peeled. Using a mandoline with its thinnest plate, slice the ginger roots. Place the ginger slices in the bowl of water until all have been cut. Fill a large pot with water and the rest of the lemon juice. Transfer the ginger slices to the pot and bring to a boil. While the ginger is boiling, spray two cooling racks with nonstick spray and place them on cookie sheets that have been lined with foil. Cook the ginger for 25 minutes, skimming off any impurities that may build up. Drain the slices in a colander and flush with cool tap water. Rinse the ginger 2 or 3 times and shake off excess water. Use paper towels to dry the ginger slices off well. In a large pan over medium-low heat, add the ginger slices with sugar. Use chopsticks to coat the slices with sugar. Continue to stir as the sugar begins to melt and bubble. Stir in the vanilla extract and lemon zest. Continue cooking and stirring the ginger until the liquid has evaporated and the sugar has crystallized onto the slices. This process takes about 15-20 minutes. Remove from heat and transfer the slices to the cooling racks. Be sure to spread the slices into one even layer—flatten out any slices that may have folded over or curled up. Allow an hour for the slices to completely dry. Store in Ziploc bags or other airtight containers. Next Post Roasted Garlic Chicken Pizza–a Super Bowl Party Must! Happy New Year, to you too! Thanks for the kind words and here’s to a great new year! Looks delicious! I love ginger and your delightful post definitely compliments the air in todays’ celebration. I clicked a bit too quickly! Happy New Year and have a wonderful weekend! Happy New Year, Jessica! Wishing you a great one filled with health, happiness, and laughter! Ooh, I have to say that I’ve never seen ginger made so pretty. Very nice, Dearie! Happy Vietnamese/Chinese New Year to you too…! Thank you very much, Stella! Happy New Year! This is great! I love and use candid ginger quite often, but usually store bought. Now I can make my own. Thank you very much for the recipe. Saving it. Hyosun–THANKS so much for stopping by! Wishing you a fabulous New Year! Hi – we travelled to Vietnam in February and bought this in the local markets. It’s fabulous! We wished we had bought a huge bag to take home. Thanks so much for the recipe! We’re going to try to make our own. And NEXT time we come to Vietman, we will buy a big bag! Just made these and they are delicious. I turned the heat off and started laying them on the tray but you need to this quickly before the toffee starts cooling down as they become too sticky. I came across some other dried ginger in Vietnam, covered in dusty sugar, whereas this recipe is similar to hard toffee. Would this be as simple as drying ginger out and coating in sugar?